Editor's Note: The concert scheduled for today, May 29, has been canceled due to inclement weather. 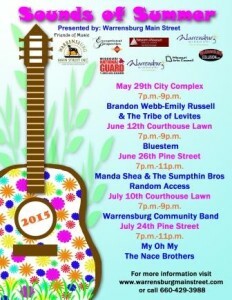 The Sounds of Summer concert series is set to take place for the third year in a row. 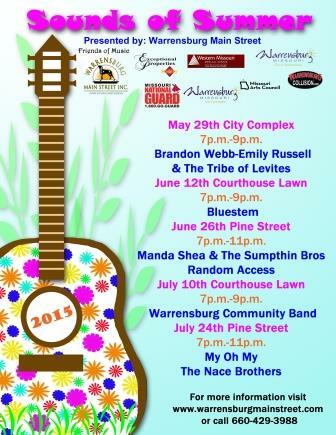 The series of outdoor concerts is put on by Warrensburg Main Street Inc. The first concert of the series is scheduled for tonight at 7:00 p.m. at the city complex at 102 South Holden St. and will feature performances by Brandon Webb, Emily Russell and The Tribe of Levites. More performances are scheduled to come throughout the summer. Purvis said the Sounds of Summer concert series fits with the aim of Warrensburg Main Street, being the revitalizing of downtown. She said the revitalization process can take on many forms. “Our goal at Main Street is to revitalize our downtown, and we do that through many different ways, and one of those ways is through promotion,” Purvis said. “Promotion can range anywhere from a downtown sidewalk sale, to a fund-raising event, to free events like this. The music of this year's Sounds of Summer is varied, ranging from folk music to classic rock. One band slated to perform on June 26 that is deeply entrenched in the classic rock sound is Random Access. Their set consists primarily of covers. Random Access vocalist John Kennedy said the band chooses songs that haven't been done to death. He cited examples like “Hard to Handle” by the Black Crows and “Crazy Little Thing Called Love” by Queen. “When you are a cover band, your mission is to do some justice to the original,” Kennedy said. Kennedy noted that many of the songs his band covers were hits when he was in high school. Random Access formed in the late '80s, and as the members grew into adulthood and started families, the band disbanded. They reformed in 2010, and now they play sporadically. Kennedy said the band's connection to Warrensburg Main Street came to be as a result of Random Access previously playing other events put on by the organization. Purvis said that the concert series serves as a form of cultural enrichment and offers the chance to hear music that someone might not hear otherwise. She noted that most of the musical talent is made up of local musicians. Purvis said she doesn't know for certain how many people from outside of Warrensburg attend the concerts, but she said Warrensburg Main Street reaches out to Whiteman Air Force Base. Purvis said she estimates the rate of attendance is usually between 250 and 350 people. She explained that factors such as the weather and other events in the area can influence the turn out. Purvis suggests for concert-goers to bring snacks and lawn chairs. She said those who have previously attended the Sounds of Summer have always thoroughly enjoyed themselves. 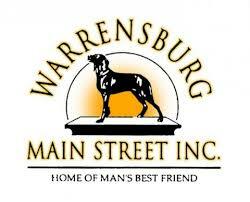 More information and a full schedule of upcoming concerts can be found at warrensburgmainstreet.com.